Posted on Sep 22, 2016 by Jason Stegent. Your registration page looks perfect. A multi-pronged promotional strategy is driving registrations left and right and you’re going to have a big audience the day of the event. Your presenters are prepped and ready to go. The slides look beautiful. Your webinar starts is 3, 2, 1 and…total mayhem. Your internet connection is all of a sudden spotty. The audio is in and out or the video isn’t working properly. Your slides aren’t navigating like they should. There’s a guy outside cleaning your office window making all kinds of noise. Your attendees are messaging that they can’t hear you. You see your live attendee number dwindle down to nothing. It’s a total disaster. Do you have options to avoid this happening to you? I promise, we’re not making this up. Simu-Live webinars are actually ‘a thing.’ It’s where you pre-record the webinar and broadcast it as a live event with live elements such as Q&A, chat, content downloading, social sharing and interaction, polling, surveys, etc. If you have presenters in different time zones, Simu-Live can prevent major headaches. It’s already a challenge to align everyone’s schedules to set time aside for the day-of, which is why pre-recording is preferred with a lot of our clients. The misconception, though, is that by recording your webinar ahead of time, you’ll miss out on the live interaction with your attendees. It’s actually the opposite! By pre-recording the meat of your presentation, you actually have more flexibility to focus on attendee involvement with questions, chats, polls, surveys, etc. to make sure the webinar experience is as interactive as possible. As mentioned in our most recent webinar, 11 Steps to Making Webinars GREAT Again! (link to reg page), “it’s quality, not quantity.” Pre-recording allows you to review and edit the webinar before the live date, ensuring that your presentation is a slam dunk. Many times in a live environment, presenters get off script, go on a tangent and lose the audience. 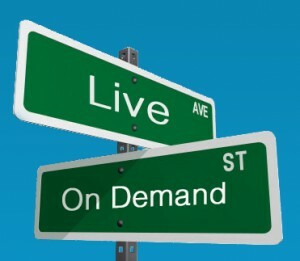 Simu-Live ensures you stay on course and deliver a webinar experience that will keep your audience engaged. Remember, one of the key metrics of a successful webinar is audience engagement. As awesome as live webinars are, some people don’t do well under pressure… especially first-time speakers. Recording your webinar ahead of the live date will calm everyone’s nerves. Presenters will be more comfortable knowing that a tongue-tied stumble isn’t the end of the world, and you will be at ease with knowing your webinar will be executed exactly how you envisioned. We’re not bashing live webinars…the majority of our clients still prefer them. However, there is another way. If you’ve ever been faced with any of these scenarios and it blew your webinar to pieces and wasted your attendee’s time, you should consider the Simu-Live alternative. This entry was posted in Recent Blog Posts on September 22, 2016 by Jason Stegent.